Born: Haderslav, 16 November 1946. World Longtrack: First 1973, Second 1976, Third 1975, 1977, 1979, Finalist 1966, 1972, 1978, 1980, 1982, 1983, Semi-final 1981, Qualifying Round 1967, 1974; Best Other Results: Scandinavian Final First 1973, Semi-final First 1978, 1979, 1980, Second 1975, Qualifying Round First 1975, 1978, 1981, Second 1980, Third 1983. Nordic Longtrack Champion: 1973, 1982. 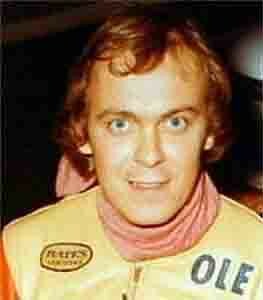 Lydden: International: First 1971, 1971, Solo First 1971; German Longtrack Silver Helmet Winner: 1974, 1977. Newcastle (1967-69), Wolverhampton (1970-75), Coventry (1976-83). First 1971, 1975, 1978, Second 1981, Third 1972, 1977.